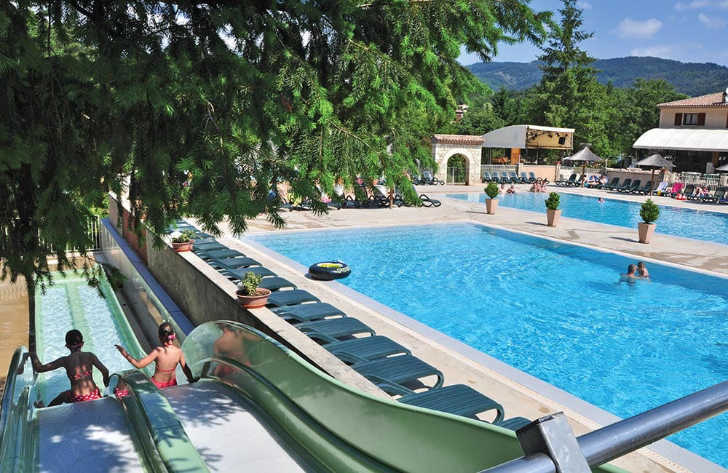 Les Ranchisses is a 5 star campsite located in Largentiere in the Ardeche region of France. Les Ranchisses campsite should definitely be on your hit list if you’re looking for a fantastic family friendly campsite which shows off all that’s great about the Ardeche region of France. The campsite is set within a pleasant woodland and covers an area of around 7 hectares. Set between the green hills and alongside a pleasant river, the Les Ranchisses is perfect for those looking for a campsite where they can get back to nature and take advantage of the great outdoors. One thing that makes Les Ranchisses so popular is the excellent range of activities and facilities on offer. You’ll find a variety of sporting activities such as football, tennis and basketball along with a selection of other fantastic activities including a fabulous wellness area. Those looking to make the most of their holiday will love the nearby river. Canoeing, swimming, building dams and many more ways to have fun can be enjoyed. As with many campsites in France, Les Ranchisses is a wonderful place from where you can explore the local area, so whether you decide to go for a walk, jump in your car, take a ride on a bicycle or even a canoe, make sure you make the most of your holiday and get out and explore! Those families who love to relax by the pool will find an excellent swimming pool complex which offers 3 swimming pools, a selection of water slides, a jacuzzi, spa and even a sauna. If you love soaking up the sun then the pleasant sun terrace will provide you with the perfect place to relax in-between your dips in the pool. Les Ranchisses campsite offers a comprehensive selection of activities and facilities on site and also nearby to ensure you have a fantastic family holiday. On-site activities at Les Ranchisses campsite include tennis, table tennis, football, basketball, volleyball, boules, gym, skateboarding, wellness area, mini golf, fishing, canoeing, playground and cycle hire. Facilities available at Les Ranchisses campsite include WIFI, restaurant, snack bar, pizzeria, takeaway, bar, groceries, games room, tv room, animation team, washers and dryers. Accommodation at Les Ranchisses campsite includes a range of 2 and 3 bedroom mobile homes that are available from Eurocamp.